Leah McFall from BBC’s The Voice joins us this Wednesday! Join us for another evening of Live Music at The House Wednesday 17th April 2013 from 7.30pm with two fabulous, talented musicians, admission is free. It is often said that ‘the best things come in small packages’, a proverb definitely not short of the truth when talking about Leah McFall. She may only stand 5′ from the ground but when it comes to vocals this wee beauty is a giant! Growing up in Belfast, Northern Ireland with a daily dose of Motown, Jazz, Gospel, Folk & Pop being play around the family home, Leah took influence from all she heard, which is reflected in both her vocal & song writing style. With her unique voice, rich tone & not to mention her 5 octave vocal range; Leah McFall is one artist to keep an eye & ear out for as you’ll be hearing a lot more from this feisty Irish talent in the very near future. 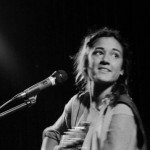 Tania is an acoustic singer-songwriter from Spain, who is now based in London. Tania started her professional career as a musician when she was 19, singing in a traditional folk band from Asturias (North of Spain). She grew up under the influence of her father’s music knowledge, a famous Asturian singer-songwriter, and has also been inspired by artists such as Eva Cassidy, Joni Mitchell, and Silvio Rodriguez. Tania is definitely one singer not to be missed. Entrance is free but booking is recommended.